Gorgeous, unique and colorful rock formations along this ride. WOW - what an exceptionally scenic ride! If you are in the Sedona area with a bicycle, this is a must do, at least from the start at the Red Rock Scenic Biway to Sedona where there is a nice bike lane along the way. The 14 miles north of Sedona to Oak Creek Viewpoint is along Hwy 89A which has no shoulder and has moderate to heavy traffic. We recommend doing this ride Sunday morning at dawn. We started the “ride” (i really doesn’t become a true “climb” until the last 3 miles) south of Sedona and Village of Oak Creek because the red rock formations of the area are quite visible for the first 10 miles to Sedano. Thus, despite the first 10 mile segment averaging a nearly flat .9%, it is well worth beginning this one at the earlier start point. Photo taken at mile 5.7 between Village of Oak Creek and Sedona. We rode this beautiful route 2 years ago and are creating this summary from memory. The climb begins just north of the intersection of Interstate 17 and Hwy 179 (11 miles south of Sedona). As we travel through Village of Oak Creek and Sedona we are in sight of gorgeous red rock formations. Aerial view south midway between Village of Oak Creek and Sedona. We travel through a canyon following Oak Creek for many miles and have many extremely scenic Arizona-style red rock formations along the way. We travel through a tight canyon from Sedona to the finish. At mile 25 we begin a set of 4 exceptional switchbacks that give us a fantastic view back down Sterling Canyon. Aerial view back towards Sedona from hairpins. We finish our climb at Oak Creek Viewpoint. Native American crafts and jewelry. Suffice it to say that this is a beautiful ride, albeit along a moderately busy highway, through classic Arizona surroundings and scenery. 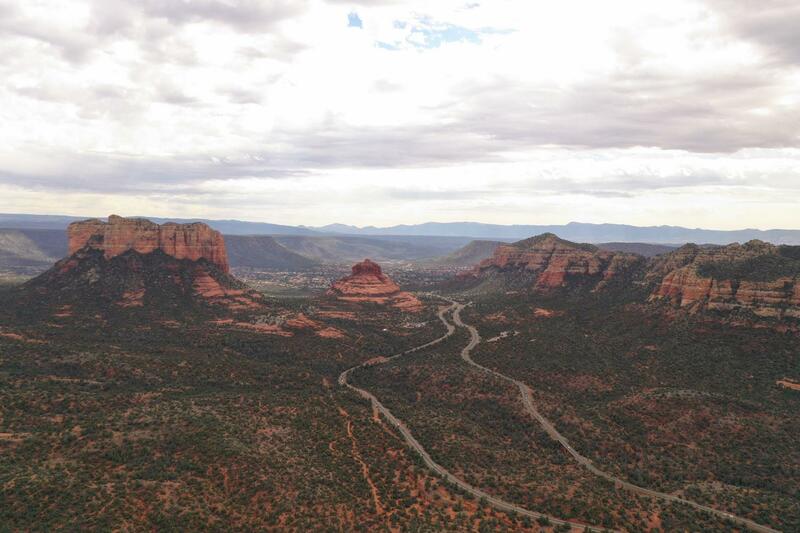 Cycling Sedona - The Dolomites of the US. Along this bike ride you will encounter some of the most beautiful rock formations in the US.